Gorgeous blue chair. Comfortable, sturdy and surprisingly light. Just keep chair away from direct sunlight. 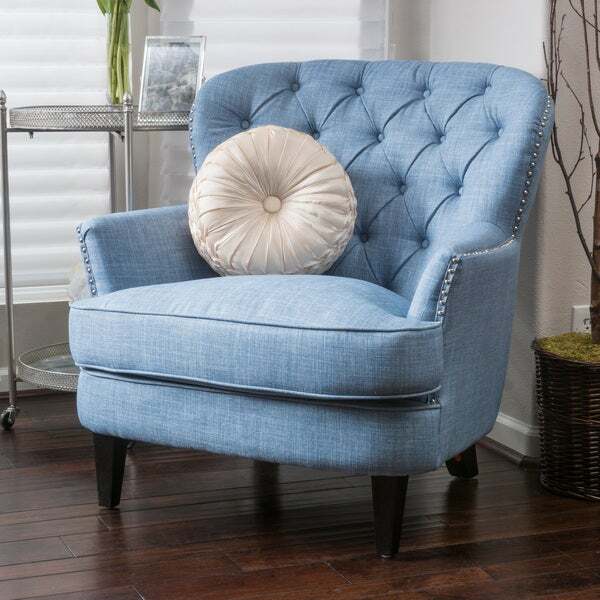 A modern twist on a classical design, this Tafton tufted oversized club chair by Christopher Knight Home will bring comfort and style to your favorite space. The chair features a low silhouette, crafted from wood with a wide back that curves into the short, narrow arms. The chair and plush cushion are upholstered in a smooth blended fabric, available in a variety of modern colors and embellished with diamond button tufting and nailhead trim for standout elegance and style. This chair has nice lines, is comfortable, and well constructed. The only thing to do is take it out of the box, screw on the legs and you're done. The fabric is nice but leans more to a blue grey than just grey. This chair is probably worth a little less than the o.co price. For a little more money, you could proably get a much better chair somewhere else. The chair looks nice - that is really the selling point for this chair. It is not particularly well made, not terribly comfortable, and it is clear that the chair will not have a very long life if used frequently. I got the chair for % off and shipping, and I still think that the chair was a bit overpriced. I will probably end up upgrading in a couple years, which is not exactly what I was hoping for in this purchase. This chair has a problem with the cushion. It constantly needs readjusting. The piping does not stay lined up. You have to unzip and reposition to fix. Then it looks nice again--until someone sits in it. ALSO, the seat is 17 inches high and 22 inches deep, not as big as specified. 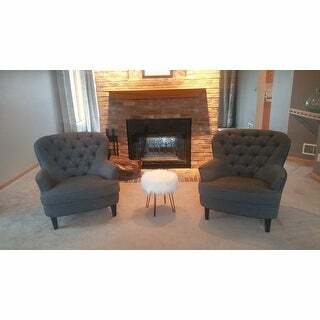 Nice Chair to watch tv in.Good price for Christopher Knight Home Tafton Tufted Grey Fabric Club Chair. It's a nice chair, but it looks sturdier than it is. The fabric seems to be a good quality, and I find it comfortable to sit and watch a movie or read for a while. However, it's quite wobbly and the legs keep turning around. I'm sure someone handy could make the wobblyness go away. It's big enough to sit cross legged on the chair, but the back isn't high enough to rest your head against (unless you're very short I guess). All in all I'm happy with my purchase. First, I could not believe that it would arrive in 5 weekdays. It did! The legs were easy to install. I like the combination of less formal fabric, with the tufted application. Otherwise they would come across as too formal. 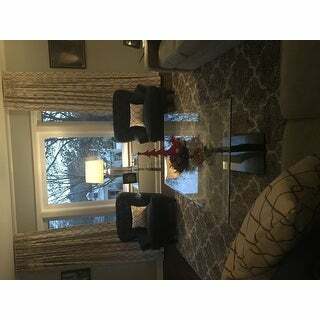 They were perfect for the living room (with the hardwood floors and stone fireplace). I needed the fabric to soften the look and absorb sound. I hate those overstuffed, mushy chairs. These are firm (but comfortable) and roomy. Love my Christopher Knight chairs. 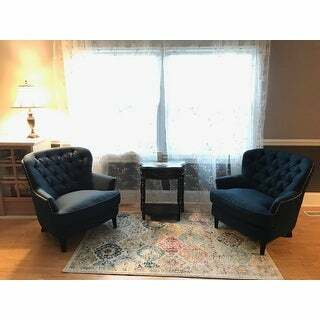 I read all the reviews on this site and other sites before purchasing 2 of these chairs for my living room. They are "nice for the price" but really are not any sort of heirloom chair. Because I am really just using them for show and occasional seating I think they will be fine. Things I like...the fabric is thick and I feel like it will wear well. The gray has a lot of blue undertone which is what I wanted. The frame construction seems sturdy and the craftsmanship of the tufting and nail heads is nice and neat. I actually find the chair very comfortable, albeit firm. Things that could use improvement...the cushion seems cheap and a bit lumpy looking. I would imagine the foam in it would break down quickly if used and sat on everyday. The section of the chair right below the cushion in the front also has those same issues. I find myself trying to constantly smooth things out. I realize that you cant make a $$$ look and feel like a $$$ chair so I am overall happy with this purchase, but if you are looking for an everyday piece, I would have to agree with other reviewers and tell you to keep looking. 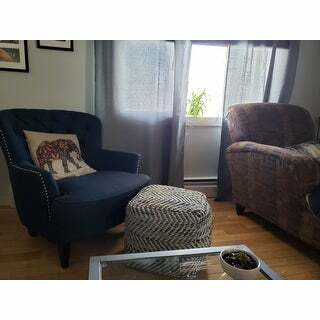 This chair looks great in our living room. The back is lower than I expected (I should have read the measurements). This chair is very roomy. My only minor complaint is that I was expecting to sink into this chair but it has a pretty firm seat. I bought these chairs to look nice not to be overly comfortable, so I am pleased with my purchase. They are a little hard to sit on but they aren't horrible. I would say they're definitely more for looks though. They are well packaged and arrived in a timely manner. The legs were easy to screw on. I'd definitely buy them again. I did a lot of research and these were well priced for the look I wanted. We purchased this chair about two years ago and it still looks new. It is more a decorative piece in our master, so it did not have much use until recently. I use this chair now (for the last five months) to feed our infant in the night. It is comfortable enough and shows no sign of wear. Between spit up and our black cat lounging in it more than I would like, I can confirm that this chair is easy to clean/hide messes. These chairs are beautiful! I ordered the navy and they really pop in the room. They are oversized just right not too big and not too small. They are very comfortable to sit in too. I purchased 2 of these chairs. The cushion are a bit hard but I love the chairs. The color is fantastic and the assemble was easy. Just screw the legs on and Voila! beautiful, comfy and look beautiful in our conference room. Very simple to put together. Would purchase again. My favorite chairs in my office so elegant especially with with fluffy pillows. I love this chair is amazing and adds a great touch to my living room. I just received this chair. Wow. I really liked it. Just the right size for the area I bought it for. Nice oversized seat area. Well made. Only assembly required to put it together was to screw in the legs. I bought the gray chair and it was true to color. I was a little ambivalent because this chair was more than I thought I wanted to spend, but I'm so glad I went for it because the seat is a few inches wider than all the other ones I saw, and I didn't think that would make a difference but it really does. So cozy, it's easy to get comfortable when you want to just sit and relax for a while. I ordered the royal blue chairs and they are beautiful! Sturdy chairs. Not wobbly. The fabric is soft. Cushion is comfortable. I highly recommend. This chair is tiny. I cannot believe this is what is considered oversized! The chair is nice but small. For a chair it's ok comfortable but I wouldn't watch a movie sitting in it. "Are the dimensions accurate? Seems quite short on the height in the description"
it is lower to the ground than most chairs, but I am 5'2", so for me, it is perfect! it is wider than most and easily fits my granddaughter and myself, great for reading books together! I do love this chair. it is very well made. "is the seat cushion really soft?" No it is a medium firmness so it provides support and comfort. The cushion is pretty firm. Which is good for me so I can get in and out of it easier. "What size r the legs. I need to replace them w longer legs"
The front legs are 6.5 inches long and the rear legs are 6 inches long. "The navy blue chair doesn’t have the ottoman?" "I'm seeing a dark grey chair in all of the review pictures - is the grey option available now the color everyone is reviewing? Or is there a darker charcoal grey too?" There is only one grey color for this chair. "What is the weight capacity of this chair?" We recommend approximately 250 pounds. "Can you suggest an ottoman if I get in the purple?"